More sites, more speed, more style. We deliver the highest quality entertainment experience available in the Capital taking our passengers through the amazing Thames Barrier, the world’s largest moveable flood barrier. 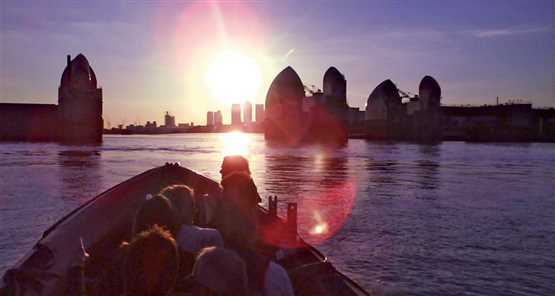 The 80 minute river tour takes you past the Houses of Parliament, Tower Bridge, Canary Wharf, Greenwich, The O2 and on through the Thames Barrier; this Thames barrier tour really does take in all London’s famous landmarks and bridges. This trip runs in all weather all year round and wet weather gear provided for passengers of all ages and sizes. All timings are subject to availability. All days and time are subject to availability at the time of booking. The Waterloo Millennium Pier is directly underneath and part of the London Eye. If you are looking at the London Eye to your right there is a ramp leading down to the pier. Above the ramp there is a sign saying ‘Discover London by the River’. Follow the pier down to Boarding Gate 1. Really good fun with excellent hosts - Dave and Scott. Dave was very knowledgeable. Highly recommend for all ages! Although it was an overcast day we were very lucky that it did not rain. When we arrived we were given thick jackets and a life jacket to don. Our guide Tom was very informative, funny and interacted very well with us and our driver Paul was brilliant. The music accompanying the trip was cheesy but we enjoyed every minute of it and sang along to it at times. This was my 1st ever trip on the Thames and I am very glad to have had such an introduction. Due to maintenance work, please access the pier via the middle gangway, situated to the left of our kiosk. Please be sure to check-in at least 15 minutes before sailing. London RIB Voyages will supply all necessary clothing and safety equipment for all weather conditions. However, it does get cold on the Thames, so it is best to bring warmer clothing. Apart from that please dress as you like, you don’t get wet (at the most a little splash). London RIB Voyages do not accept expectant mother aboard at any stage of pregnancy. London RIB Voyages advises you NOT to travel if you have any historical or current backbone conditions or complaints. They are not medical experts so instruct you not to travel if you suffer from a back condition. London RIB Voyages does not accept any liability for personal injury, or injury to others and/or loss damage. All boats can experience unpredictable movements that can aggravate existing medical conditions. You must inform us of any material fact, including medical conditions or disabilities, which may affect the skipper’s decision to carry you as a passenger, especially epilepsy, dizzy spells, diabetes, angina or any other heart conditions, back/bone conditions or back problems. Please note that experiences may sometimes be cancelled at short notice due to insufficient numbers. In these circumstances, we will notify you at least a day in advance and try to find a suitable alternative time or date for you.